The idea is that the citizens of each nation... will grow into closer united friendship with their countrymen, without discrimination or divisions of any kind. In time it is hoped that these national efforts will overflow into worldwide understanding and friendship. *Ever since the cliché ‘Flying Saucer’ was coined, the greatest and most exciting mystery of our age has been automatically reduced to the level of a music hall joke. The comics of Vaudeville and the comedians of State and Science banded together, most successfully, to encourage humanity in its oldest and easiest method of escape—to laugh at what it does not understand. All this has been foretold by men of old...in your written prophecies.... we know the history of your world well. The conception of ‘We are our brother’s keeper’ applies to all mankind everywhere. George Adamski (17 April 1891 – 23 April 1965) was a Polish American citizen who became widely known in ufology circles, and to some degree in popular culture, after he claimed to have photographed spaceships from other planets, met with friendly Space Brothers, and to have flown with them to the Moon and other planets. The idea is that the citizens of each nation, through these efforts, will grow into closer united friendship with their countrymen, without discrimination or divisions of any kind. In time it is hoped that these national efforts will overflow into worldwide understanding and friendship. On 24 June 1947, when Kenneth Arnold saw a fleet of ten shining circular disks whizzing along at a thousand miles per hour, darting in and out of the peaks around Mount Rainier, State of Washington, the news flashed round the world with the speed of light waves, and started the commotion we call flying saucers... from then on a steady stream of reports came in, mainly from trustworthy, observant citizens who had noticed that an early form of locomotion was once more active in the air. In spite of constant denials and quite unbelievable explanations, the governments of the world have gradually been forced to give their attention to the matter and to create secret departments for investigation. Today, the American Government has dropped its original attitude of disbelief and admitted that it has over eighteen hundred authentic cases on its files. The British Air Ministry is more cautious, but grudgingly admits that it also has a secret department to deal with or to discourage questions. The American Government, however, on 25 September 1952 dropped the alarming hint that it accepts these phenomena but hints that it is not in the public interest for it to publish all it knows. Ever since the cliché ‘Flying Saucer’ was coined, the greatest and most exciting mystery of our age has been automatically reduced to the level of a music hall joke. The comics of Vaudeville and the comedians of State and Science banded together, most successfully, to encourage humanity in its oldest and easiest method of escape—to laugh at what it does not understand. From then on, anyone who said ‘I have seen a flying saucer’ or, worse, ‘I believe in flying saucers’ was considered... a crank. Despite evidence to the contrary (and there is enough of it to fill many volumes), there is still a widespread notion...that flying saucers are some kind of American joke..that the mystery has already been cleared up...and that there is nothing more to worry about. For this latter notion we can thank those semi-scientists and self-appointed ‘experts’ who have simply failed to study the facts. Too many glib pontifications have been issued to the Faithful by those who should know better...to say, as their perpetrators say, that they cover all the cases on record is a flagrant untruth for which a Higher Justice may, or may not forgive them. I have devoted the last two and a half years solely to the investigation of this phenomenon: that I have studied thousands of cases and read reports both ancient and modern; that I have studied with an unbiased mind things which seemed possible, and things that seemed impossible, and that I feel as qualified to speak as any ‘expert’ who after a few weeks, or even days, of research calmly announces the once-and-for-all solution, and returns thence to his normal activities. I take flying saucers extremely seriously; but I deplore pedantry and, like the ancient Toltecs, I find the serious things of life a cause for joy and pleasure rather than for pompous gloom. I would like to devote little time to proving or disproving the reality of these wonderful flying objects... but for those who have heard of saucers only by hearsay or read of them in the popular Sunday papers that would prove a little unsatisfactory, so I shall dedicate the first part of this book to an account of what has happened up to the time of writing. 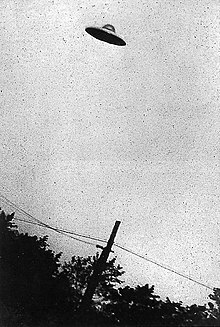 Although I quote less than two hundred incidents, these have been selected from nearly two thousand cuttings, reports, articles, manuscripts and ancient documents supplied to me by kind helpers from many countries... For the past eighteen months barely a single day has gone by without flying saucers being reported somewhere in the world... On some days there have been as many as ten different sightings in different places. And if a thing is seen daily, week after week, month after month, by ordinary people in free countries, then it follows that the thing in question must surely exist. On 21 June 1947... man named Dahl was out in the Tacoma Harbour Patrol boat near Maury Island. He looked up and saw six large disks about 2,000 feet above him. Five of them were slowly circling one that seemed to be in difficulties. Slowly they sank to within 500 feet of the sea, without a sound or whisper. Two airline pilots, Adams and Anderson, were flying their D.C.3 the 130 miles from Memphis to Little Rock on the night of 31 March 1950 when a huge glowing flying saucer zoomed down at terrific speed to investigate them. On the central cupola there was a bright blue-white flashing light—either a signal or part of the propelling mechanism. And on the lower side, the airline pilots observed a row of eight or ten brilliantly lighted portholes. They thought they were portholes, but admitted that they could have been vents through which some kind of powerful energy was flowing. ‘I’ve been a skeptic all my life’, said Adams in his report,’ but what can you do when you see something like that ? We were both flabbergasted.’ Both pilots were slightly blinded by the glare. ‘It was the strongest blue-white light I’ve ever seen,’ said Adams. Nine flying saucers, in loose formation, were seen by Captain E. Smith, of United Airlines, eight minutes flying time away from Boise, Idaho, on 4 July 1947. Smith and his copilot, Ralph Stevens, saw the disks silhouetted against the late-evening sky, and at first thought they were aircraft. Notice, please, that they were ‘silhouetted’. Fireballs, illusions, and refractions of light do not produce dark silhouettes against the evening, or any other, sky. Four more saucers joined the group, giving the two pilots and their stewardess time to observe them thoroughly. A red glow in the clouds over Godman Field, Kentucky—a disk the size of the Pentagon, lurking, silently, above a fighter base—a construction dwarfing the Queen Mary [British ocean liner that sailed primarily on the North Atlantic Ocean from 1936 to 1967: 1,019.4 ft (310.7 m)] supported by dull orange flames that lit up the cloud base and caused Captain Mantell, of the U.S.A.A.F., to be dispatched in his tiny pursuit plane to investigate. When Mantell found it, his voice came over the radio, full of excitement. It was immense, he said, a colossal metallic thing, 500-1,000 feet in diameter, and cruising at 250 m.p.h. He was going to try to overtake it. As soon as it sighted (or sensed) him, the giant began climbing at 400 m.p.h. It accelerated faster than any jet, and Mantell went streaking up in pursuit. The next news of Mantell was that the wreckage of his plane had been found in tiny pieces, scored by peculiar deep lines as if he had got into a shower of some terribly powerful unexplainable something; as though he had flown into the tremendous exhaust stream—or worse—against which no terrestrial metal could survive. Ex Cathedra spoke Authority. First, Mantell had been ‘chasing the planet Venus’. Will some kind illusionist kindly explain how the planet Venus could appear as a disk 500 feet across, going at 200 m.p.h. ; afterwards climbing rapidly and emitting orange flames ? Later, we read of a new official explanation, that Mantell had hit a ‘Skyhook’ meteorological balloon and crashed. Well, say he had ? Would it tear his plane to pieces ? I am quite willing, for anyone who will pay my expenses, to pilot a fighter plane through a Skyhook balloon any time of the day or night and observe the results, without very much fear of hurting myself. But when has a Skyhook ever cruised along at 250 m.p.h., or risen sharply at 400 m.p.h., with orange flames, etc., etc., into the bargain? But officially Mantell had chased the planet Venus, metamorphosed later into a Skyhook balloon, and thus, alas, met his death. 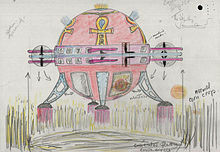 ...This Venus idea makes it very hard to understand a sighting at White Sands Rocket Testing Ground, New Mexico, where a flying saucer was tracked by radar, and found to be cantering along at a mere 18,000 m.p.h. As I approached him a strange feeling came upon me and I became cautious. At the same time I looked round to reassure myself that we were both in full sight of my companions. Outwardly there was no reason for this feeling, for the man looked like any other man, and I could see that he was somewhat smaller than I and considerably younger. Suddenly, as though a veil was removed from my mind, the feeling of caution left me so completely that I was no longer aware of my friends... By this time we were quite close. He took four steps toward me, bringing us within arm's length of each other." Now for the first time I fully realized that I was in the presence of a man from space - A HUMAN BEING FROM ANOTHER WORLD! The beauty of his form surpassed anything I had ever seen. And the pleasantness of his face freed me of all thought of my personal self. I felt like a little child in the presence of one with great wisdom and much love, and I became very humble within myself ... for from him was radiating a feeling of infinite understanding and kindness, with supreme humility. He made me understand that their coming was friendly. Also, as he gestured, that they were concerned with the radiation going out from earth. I asked if this concern was due to the explosions of our bombs with their resultant vast radio-active clouds? He understood this readily and nodded his head in the affirmative. A deep analysis of events of the past makes me firmly believe that these people from other planets are our friends. I am convinced that their desire and their object is to help us and perhaps to protect us from even ourselves, as well as that they mean to ensure the safety and balance of the other planets in our system. Let us be friendly. Let us recognise and welcome the men from other worlds! They are here among us. Let us be wise enough to learn from those who can teach us much — who will be our friends if we will but let them! I do have witnesses to one of my journeys in a space craft. Both are scientists who hold high positions. Once they are able to make a statement the picture will change overnight. However, the way things are nowadays with everything classified as security, for the time being they must remain in the shadow. When they believe that they can release the substantiation they have without jeopardizing either the national defense or themselves, they have said that they will do so through the press. How soon that will be, your guess is as good as mine. But because they were with me at the request of the Brothers, some things are moving in behalf of both the Brothers and the general public that otherwise could not have been started. And much as we would like to, we cannot speak of these things yet because good intentions can have bad reactions. Anything acted upon prematurely can ruin the best beginnings. I can see your point about personal witnesses who, free from security or personal reasons, would be at liberty to speak out and support me. But just as skeptics would question my own affidavit, would they not question that of anyone else? This was proven in regard to the sworn testimony of witnesses present at the meeting described in Flying Saucers Have Landed. When a critic is a critic, one can bring the Almighty before him and still he will question. Even the average man is quick to doubt anything that is new to him. Look what they have said about the space craft photos which show objects entirely different from any made on Earth—and which have been photographed by many people in different parts of the world! So, no matter how you look at it, unless the person himself has that something necessary to recognize truth, it would make no difference what was presented as evidence, he still would want concrete proof to suit his own understanding, ignoring all the other minds in the world. It is almost like this: he who has the depth of life within his being needs none of these, but he who has not, as Jesus said, “shall ask for signs, but no signs shall be given,” for if they were, the doubters would not understand them. His words are just as true today. Was it not the so-called professed authorities in times gone by, as they are today, who criticized and disparaged everything proposed for the betterment of man? The kind of proof demanded was premature and could not in wisdom be given. But time and patience finally vindicated those who brought forth the ideas. Humanity is that much better off today because of them—not because of the skeptics! Let the critics ask! Their very opposition may serve as a stimulant for their own curiosity, causing them to enter into a deeper research or analysis. The truth will always prevail in spite of personal or limited opinions. Perhaps the Brothers from other planets are waiting until the inner being of men on Earth stirs ever so slightly toward a wakening stage, with desire for a better living amongst his fellowmen. Perhaps faith is of paramount importance; not blind faith, but that knowing faith which comes only from within and cannot be swerved from what it knows to be true. The first book did contribute to such an awakening. The purpose of this book is to stimulate this activity into even greater growth and understanding. No scientific support of any kind was present for the events described in the first book. But events that have taken place since publication, and coming from different parts of the world, have proven greater support than anything that I could have produced on publication date. This has happened in spite of opposing forces who, for whatever reasons, do not wish the truth to come out... I have been well protected against many things, as well as guided. So far, the Brothers have never let me down. So if we wait patiently and in quiet confidence, things will come out as they should. There will be more abun­dant proof throughout the world than I, as one man, could ever be given or, in turn, give out. [Orthon:] Our ships perform feats in your skies which no Earthly planes of any nation can do. Your scientists know this. Your governments know this. The pilots of your planes everywhere in your world have seen us and marveled. Thousands of your people have looked up and been amazed. Thousands more everywhere are now watching and hoping for a glimpse of us. All this has been foretold by men of old. They have said in your written prophecies that the whole world will be disturbed... The conditions in your world today have placed you, as you put it, under the shadow of death. Your entire world is disturbed. And since the name you have for outer space is ‘Heaven,’ and since we too are Sons and daughters of God, could it not be that even now the ancient prophecy is being fulfilled? You see, we know the history of your world well. The conception of ‘We are our brother’s keeper’ applies to all mankind everywhere. It is in this role that we come to you and say, ‘Let the Supreme Being of the Universe be the guiding word for your world that your troubles may vanish as darkness before light.’ What would man be without the breath of life? And who giveth unto him? Is it not to be found everywhere for the benefit of all? Then let Earthly man know that his God is not in some far distant place, but ever near in all manifestations, and within Man himself. Orthon ceased speaking and for a moment I sat with bowed head thinking of his words. Slowly, I became aware of a warmth that seemed to be entering into my spirit. Looking up, I saw from the faces of those around me that what I felt was a benediction that flowed from all of them toward me. [Orthon:].. much of what our brother has been saying to you is in conflict with many things your people have been taught to believe as truth. This, in itself, is of no importance, since that which was learned yesterday serves only as a stepping stone toward the greater truth we can learn tomorrow. That is the law of progress. Once on the right path, it cannot be otherwise. it is essential always that men work and strive together with open minds, ever aware that all is never known. There is an infallible guide in determining whether the path is a right one. That is very simple. If the results of your thoughts and actions are evil, then the path you are following leads away from the light of His countenance. If good things follow along the way you go, then your lives, and the lives of your children and of their children, will be joyous. Blessings, unbroken by sickness and strife, will be your eternal heritage. None of the contactees, whose accounts were not contaminated by the disinformation campaign, had anything but positive experiences to share. The message they were asked to convey... was one of empowerment for the human race: We must avoid further armed conflict if we are to prevent self-annihilation, and it is feasible to create a peaceful future through international cooperation and making sure everyone’s basic needs are met... However, being engaged in a nuclear and conventional arms race..., the Western industrial-military complex, which includes the fossil and nuclear fuel industry, felt this message was not in their interest. So much so, that governments and their military... decided in the mid-1950s that, despite the cover-up of the army’s salvaging of one or more crashed flying saucers, the contactees’ message of international co-operation for peace and brotherhood was being too well received. An indication of this popularity can be found in the fact that, within three years of its publication Flying Saucers Have Landed (1953), the book which included George Adamski’s initial contact experience, was reprinted twelve times in the US alone and published in seven (!) other languages. On various occasions George Adamski testified to the many commonalities among the various religions as different expressions of the same truth, among which the cyclical appearance or return of a Teacher, which he... [confirmed] that “there have been many messiahs…” In the Wisdom teachings, in which Adamski was versed as a teenager, this cyclical appearance of a Teacher is known as the Doctrine of the Coming One, which is also evinced in almost every religion: Christians are waiting for the Second Coming, Jews are still expecting the Messiah, Buddhists await the Fifth Buddha, Hindus the tenth incarnation of Vishnu, or Kalki Avatar, and segments of Islam are waiting for the return of the twelfth Mahdi, or Imam Mahdi. I first read about UFOs in Flying Saucers Have Landed, a book in which George Adamski wrote, in the last chapter, his experience of meeting a Venusian in the Arizona desert. The book... was the history of flying saucers over many ages, in different parts of the world. It was research — historical, speculative to some degree, and it finished with Adamski’s actual experience. These were very interesting conversations, and so for me the UFO phenomenon was more to do with the purpose, the meaning behind the flying saucers as they were called, than the phenomenon itself. The fact that people from other planets — some people think other solar systems but my information is that they come from other planets of our system — were concerned enough to visit this planet was interesting, but the nature of their concern was much more interesting. Their concern was that we should not destroy ourselves. That we should change our way of life, our way of organizing our world, not to destroy the world from an ecological point of view, and not to destroy each other in a war using nuclear weapons. It was a philosophical, spiritual discourse which...[Adamski] had with the Venusian Master, and that is what really impressed me about the book. Like Adamski, Greer says these aliens are basically good. And Greer, too, has a dire message, focusing on the need to eliminate space-based weapons and avoid ecosystem collapse. Of all the contactees, Adamski attracted the most controversy and odium; and none but a man of his strength of character could have survived the onslaught. Young George grew into adulthood with wonder and reverence toward all phases of nature. In such a world, the boy felt, it should be easy for people to live in harmony...It seemed...that the lessons to be found in the pages of history had not been learned... that the people... individually and collectively, were still walking in old ruts that could lead only to repetition of the same old disasters... With what knowledge he might gain, he hoped to serve his fellow man in some small way... Realizing that the student was not yet equipped to be the teacher, for many years he traveled around the nation, earning his living at any job that offered. It was a good way to study the problems and frustrations from which no man is free. His was no grimly pursued mission, nor was it in his nature to mount a soap box. The blend of patience, compassion and gaiety, so marked in the mature Adamski, must even then have been the qualities which attracted the confidences of his fellow workers. It was not until he was nearly forty that Adamski... settled down... in California. This was his first real home and here, through the nineteen thirties, he devoted full time to teaching the universal laws. His students soon numbered into the hundreds, he found himself in demand for lectures throughout Southern California and his talks were broadcast over radio stations KFOX in Long Beach and KMPC in Los Angeles.